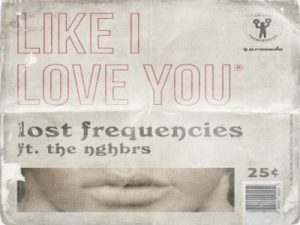 Exactly four years ago Lost Frequencies took the electronic music scene by storm, when the Belgian released his version of ‘Are You With Me’, a track that was originally released by US country singer Easton Corbin in 2012. The super catchy debut single of 24-year old Felix de Laet reached the number 1 position in almost every European country and ever since, there’s been no stopping Lost Frequencies. Today he dropped another new single that scores a perfect ten on that same catchiness scale, titled ‘Like I Love You’. The brand new track is a collaboration with L.A.-based rock band The NGHBRS and even though summer is rapidly coming to an end, ‘Like I Love You’ makes you feel like summer has only just begun. The song starts off with Lost Frequencies’ signature plucky guitar play, quickly followed by the smooth vocals of The NGHBRS‘ vocalist Ian Kenny.